Tiger Woods took a share of the Masters lead in round one with back-to-back birdies on Nos. 13 and 14. The birdie on 14 will be the hole everybody will be talking about until Woods tees off on Friday. 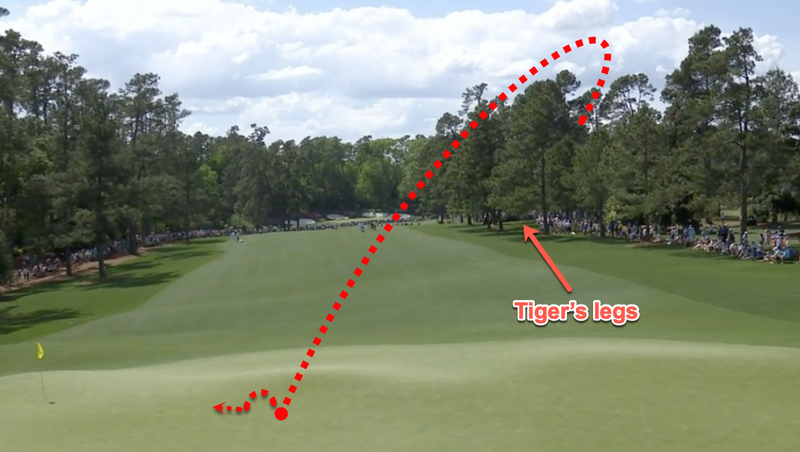 Woods saved what looked like an inevitable bogey — or worse — and turned it into a birdie with a gorgeous save out of the trees, a long putt, and a fist pump. Tiger Woods had a strong first round at the Masters, finishing at 2-under, one shot behind the leaders. A few holes earlier, Woods turned back the clock with back-to-back birdies on Nos. 13 and 14 to take a share of the lead at 3-under. In particular, it was the sequence on 14 that had everybody buzzing. Woods’s tee shot went left of the fairway and landed among the tree. From the green, you could only see Woods’ legs and it seemed like the best-case scenario at that point was a bogey. But instead of playing safely back into the fairway, Woods found a gap in the trees to his left and hit a beautiful slice over the trees and safely onto the green. That led to a long putt for birdie and a share of the lead.